The Homelegance Laertes is a power loveseat recliner with top grain leather upholstery. A solo recliner can be one of the comfiest seating options, but there’s a downside in the fact that you can’t sit close to anyone since they’re so bulky. If you’ve got someone to kick back and relax with, however, loveseat recliners provide the perfect choice. Do you need each seat to have separate footrests, or is one large footrest better? Do you prefer a center console that separates the two seats slightly? Do you want a manual recline mechanism, or a power recliner? Now that you have those answers in mind lets take a look at some great loveseat recliners. Still on the fence? We’ll cover some details about a few of our favorite options to help you distinguish which will be your best loveseat recliner. The Homelegance Laertes Two-Tone is a power loveseat recliner, meaning that the chair’s legs raise with the push of a button. The seat of this chair is upholstered in top grain leather while the sides and back are polyester. The upholstery makes a statement with a pretty two-toned pattern. It is 79 inches wide by 36.5 inches deep by 39.5 inches tall. This option is highly priced due to the high end upholstery and the power recline feature. If you need a loveseat recliner with a console or cupholders, there are variants of this model available with those features. 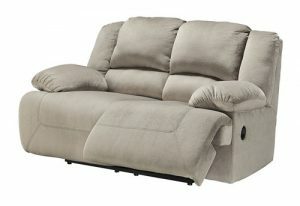 The Ashley Furniture Signature Design Toletta Loveseat Recliner is a plushly padded place for two. This is a perfect chair for cozying up with your significant other. It is upholstered in a soft microfiber, and available in a light grey or a dark brown. It measures 73 inches wide by 41 inches deep by 41 inches tall. This is a manual recline chair, and does not include a center console or cupholders. 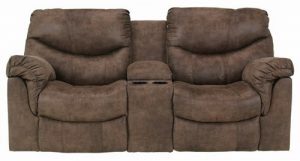 The Ashley Furniture Signature Design Alzena Recliner Loveseat features a center console with two cupholders. 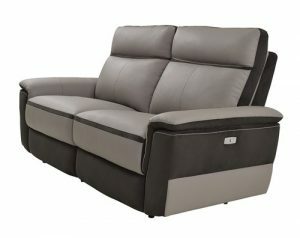 This option is larger than many other recliner loveseats, measuring 80 inches wide by 39 inches deep by 42 inches high. It is a manual recliner, and both leg rests are operated individually. With this choice you’ll have a nice place to house a remote or a book, but you’ll lose the ability snuggle if that’s you’re priority.